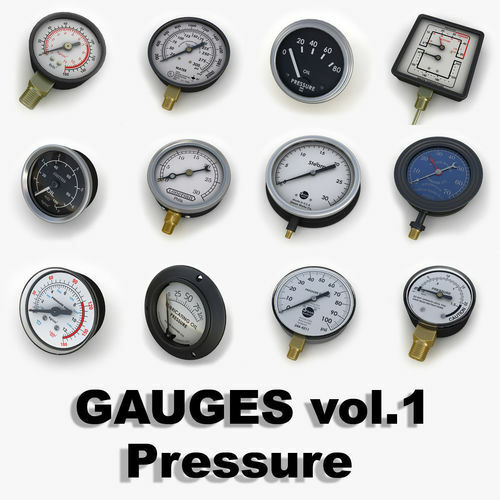 Pressure Gauges 3d models collection. This is a tools (devices) for measuring pressure of steam, gas, oxygen, air, liquids, oil etc. Usually uses as a part of another machine or device. This 3d models useful for garage, laboratory, workshop, industrial, science scene visualizations, quality enough for close up renders. Vintage large steam pressure gauge Model ID: #843680 10.Vintage large steam pressure gauge 02 Model ID: #843666 11.Water & steam pressure gauge Model ID: #843275 12.Steam pressure gauge Model ID: #843547 --- Additional information about interested models in collection you may receive using model ID. --- Rendered with Vray on one subdivision, texture of pressure gauge scale included in to archives. Vray and standard versions of max file included, render scene and HDRI map - not included.